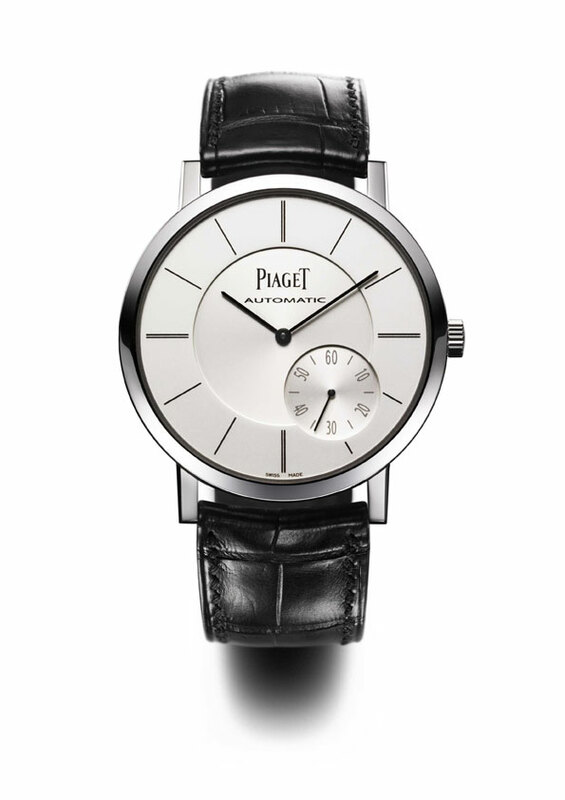 Piaget’s latest, Altiplano 43mm “anniversary edition”–Calibre 1200P and Altiplano 43 mm – Calibre 1208P are thinnest watch: their thickness 5.25 mm. It displays only essentials: hours and minutes. Both will be issued in two anniversary editions: one in 18-carat pink gold and the other in 18-carat white gold, each issued in series of 235 – a symbolic number echoing the movement’s record slimness: 2.35 mm. The individual number is engraved on the oscillating weight of each movement. Whereas the gear trains of a classic movement usually measure around 0.2 mm, those of the 1200P are just 0.12 mm thick, which is scarcely more than a hair’s breadth (0.08 mm). It also has a balance with low inertia (2.90 mg.cm2), a frequency of 21,600 vph and an approximately 40-hour power reserve. Engraved with the inscription “1200P”, the case provides the perfect receptacle for the movement specifically made for the other. The glass is deliberately flat rather than convex in order to accentuate the slimness of the case. 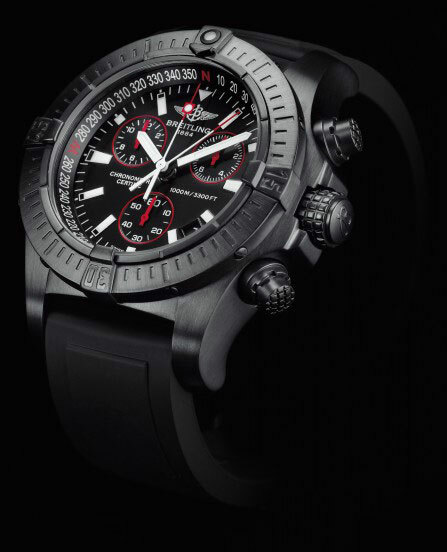 The various dial levels further reduces the thickness of the watch while limiting hand-setting heights. The case in 18-carat pink gold matched with a midnight blue dial, or in 18-carat white gold framing a black dial, is equipped with a transparent case-back enabling one to admire the movement and the crown bearing the “P” for Piaget. A pin buckle reflecting the aesthetic of the bezel complements the watch. The Altiplano 43 mm Calibre 1208P model’s oscillating weight is crafted from 22-carat gold, while a small seconds display at 4 o’clock enlivens the dial and makes the record 2.35 mm slimness of Calibre 1208P even more remarkable. Piaget sets two new records: that of the thinnest mechanical self-winding movement on the market at 2.35 mm; and that of the thinnest watch in its category, measuring a mere 5.25 mm. The Reverso Squadra Chronograph GMT Palermo Open shows legitimate pride in its status as the only automatic chronograph in the entire Reverso range. Jaeger-LeCoultre have managed to bridge space and time to connect the first watch with a swivel case conceived on a polo field in India. 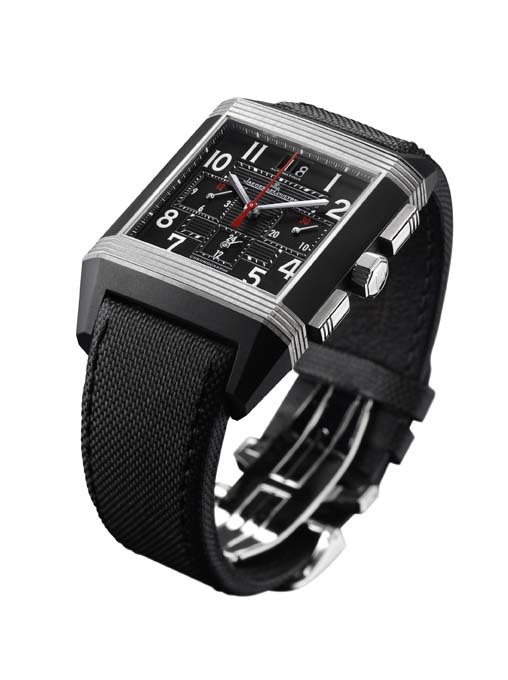 Its unique case made from vulcanised rubber for the first time in the rich history of the Reverso. The brand designers have emphasised the superb depth of this colour by creating chromatic compositions on the supporting elements and dial. This case houses the famous automatic Calibre 754 and the chronograph which is indispensable in measuring crucial moments; and the dual time-zone indication that helps preserve the strength of the mental ties with loved ones back home. Its accuracy is ensured for full 65 hours by a variable-inertia balance guaranteeing enhanced shock resistance and accurate long-term adjustment (by means of screws placed on the balance rim, and the laser-welded balance-spring). Moreover, this caliber comprises two high-end chronograph signature features: a column wheel and a vertical coupling-clutch. The former is a wheel that coordinates all phases of the chronograph function, thereby ensuring their perfect synchronisation, while the latter guarantees extreme reliability. The hour and minute hands are rhodium-plated, while the fiery red central seconds hand stands out clearly against the elegant black dial with its guilloché-work centre. The large date at 12 o’clock counterbalances the dual time-zone display at 6 ‘clock, while the chronograph hour and minute counters, also featuring rhodium-plated hands, are placed opposite each other at 3 and 9 o’clock. The presence of a luminescent substance naturally facilitates reading off the indications, even in the dark. 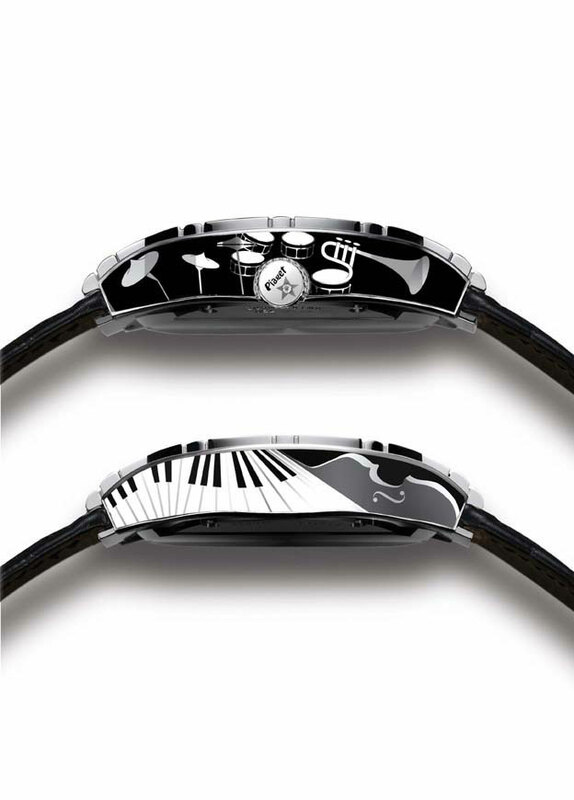 The JLC artists have pursued the play on light through splendid two-tone effects on the other parts of the watch. They pay a splendid visual tribute to the unique two-part structure of the case through two remarkable associations of materials. 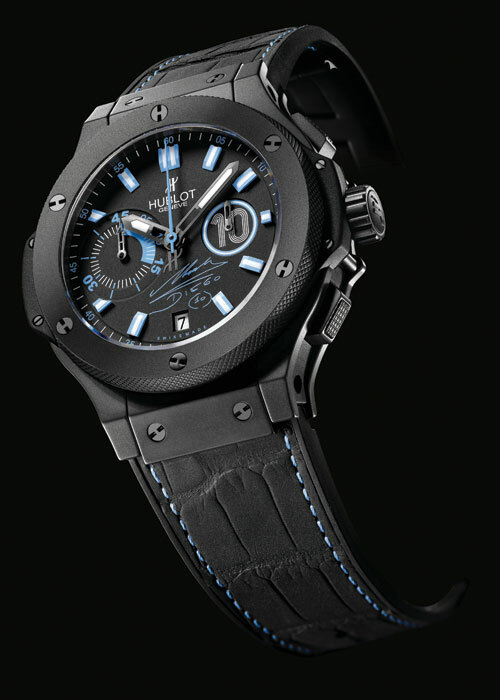 The first version combines the intense black of vulcanised rubber with the gleam of steel, while the second, issued in a limited edition of 500, plays on the appealing alternate use of intense deep black and the glowing warmth of pink gold. To further enliven this dynamic antagonism between organic and metallic elements, the watch is fitted with a technical strap featuring a rubber core surrounded by an incomparably rugged textile coating. 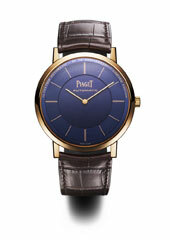 Its matt tone further reinforces the resolute face of this powerful and uncompromising timepiece. 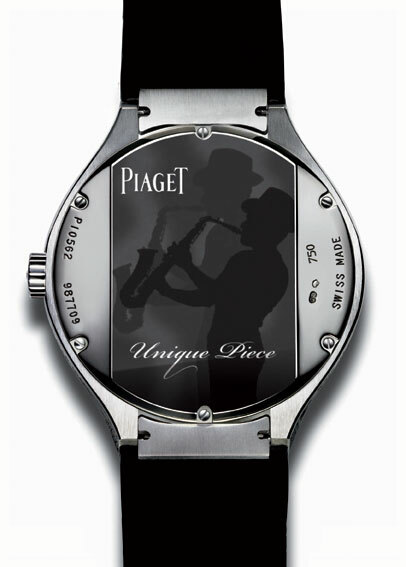 Jazz is the soul of Piaget’s new creative collection unveiled at SIHH Geneva in 2010. In a jazz club, a pianist picks out a few notes progressing from blues to an improvised swing tune. It’s dance time: a singer takes the stage, oozing seduction. Her velvet voice takes over from the band to tell a private story and to transform itself into a precious moment. The 18-carat white gold case and ellipse set Limelight watch with 120 brilliant-cut diamonds, 18-carat white gold dial set with 65 brilliant-cut diamonds has Piaget 56P quartz movement. 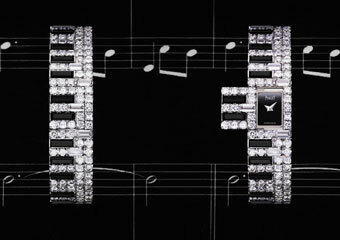 The 18-carat white gold pin buckle set with 15 brilliant-cut diamonds comes black satin strap. 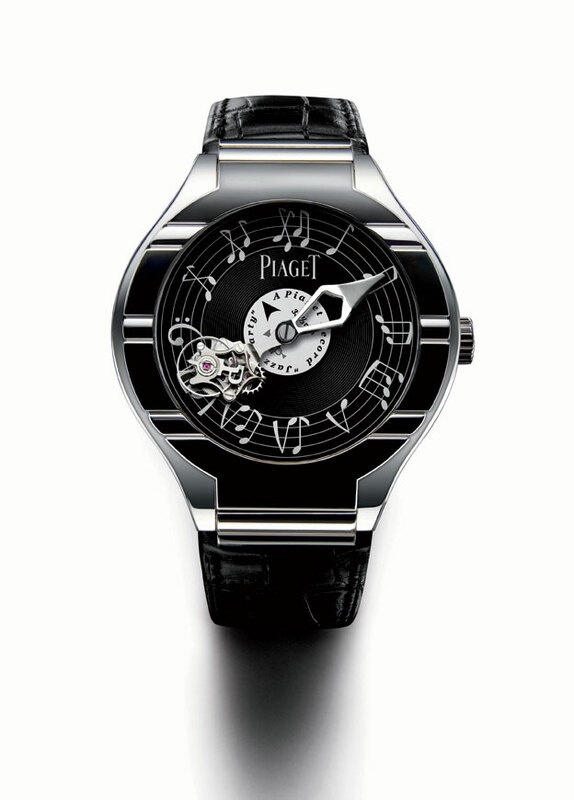 The Piaget Polo Tourbillon Relatif 18-carat white gold watch with black grand feu enamelling according to the champlevé technique depicts jazz music instruments. This Manufacture Piaget 608P mechanical hand-wound flying tourbillon movement is 3.28 mm thick with power reserve of 68 hours appx. The enamelled case-back portrays a jazzman. The black alligator leather strap watch comes with 18-carat white gold folding clasp. This one-of-a-kind model has the profile at 3 o’clock pictures musical instruments such as a drum kit and a trumpet. The crown evokes the bass drum of the Limelight Jazz Party drum kit. The profile at 9 o’clock shows a piano and a double bass. 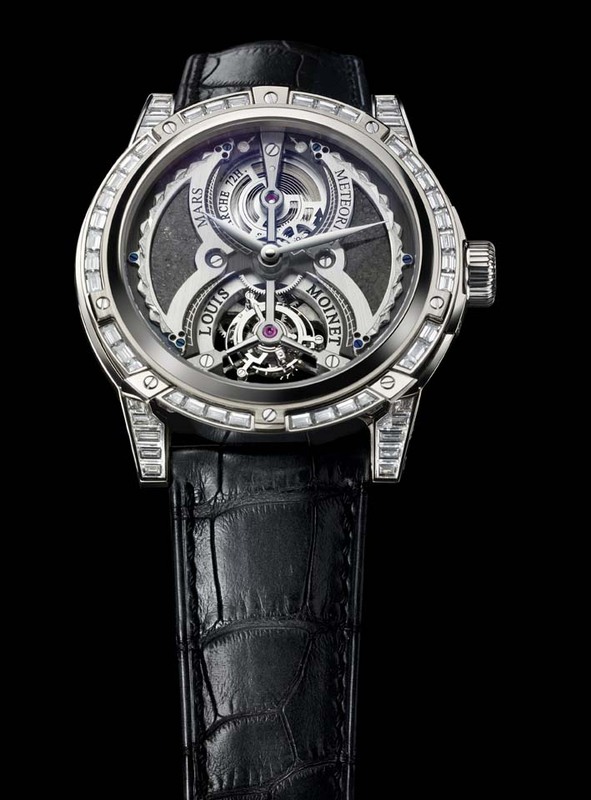 Atelier Louis Moinet, named after one time associate of Abraham-Louis Breguet, father of tourbillon, unveiled four solar system-inspired tourbillon watches, each with its own genuine meteorite at the maiden Geneva Time Exhibition. The four watches unite to complete one-of-a-kind planetarium display, creating pièce de résistance for the ultimate watch collector. 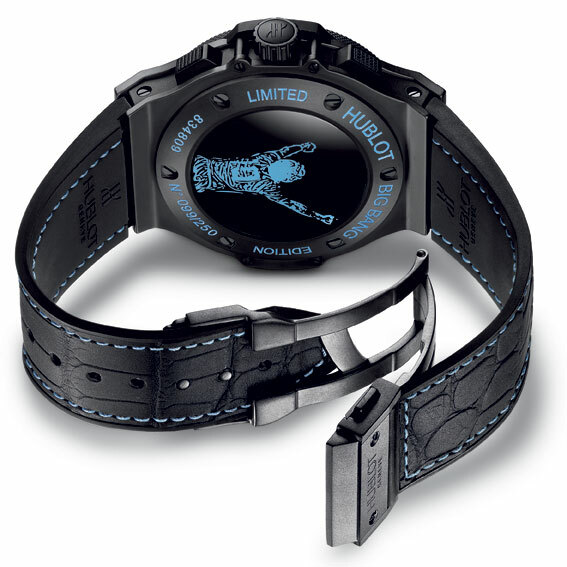 Together, the four Meteoris watches uniquely unite the most legendary meteorites and depict the solar system in spectacular fashion, with each watch featuring a unique authenticated meteorite and a beautiful design inspired by that meteorite’s history and/or origin. Who said you can’t own a piece of an asteroid? The Meteoris Tourbillon Mars proudly displays the first stone from Mars ever used in watch making. That stone is finely inlaid into a hand-engraved dial and adorned with an astrolabe-type appliqué. 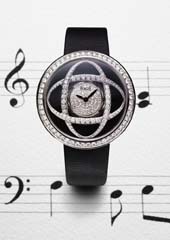 The case is crafted from 18-carat white gold set with 56 baguette-cut Top Wesselton VVS diamonds totaling 3.46 carats. This meteorite was discovered in the Sultanate of Oman in 2008, and has been authenticated by the Russian Academy of Science, Moscow. The others in this series are the Meteoris Tourbillon Rosetta Stone featuring the meteorite by the same name; the Meteoris Tourbillon Asteriod with parts from Itqiy, a mysterious asteroid that was formed near the sun; and the first tourbillon to display an authentic lunar meteorite, the Meteoris Tourbillon Moon which is distinguished by its dark structure featuring a number of fine occlusions and its 18-carat rose gold case. 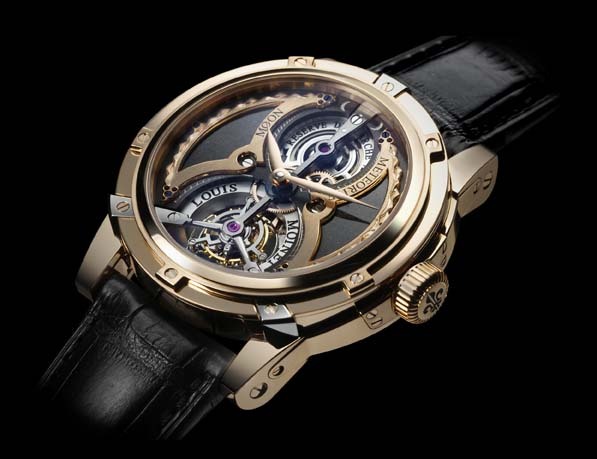 As with other Louis Moinet tourbillons, the magic of the Meteoris tourbillon movement is intensified by connecting its carriage to the barrel by means of a hand-drawn and beveled vertical bar. Each watch also features an open worked version of the barrel, with a cover that performs an average rotation in six hours. Exclusive to the Meteoris, however, is the hand-wound tourbillon movement that beats at a cadence of 21,600 vibrations per hour. Each watch provides spectacular visibility of the winding mechanism through its case-back. The “octopus” spring plays three roles by acting as pull-out piece spring, lever spring and click spring. Each Meteoris is presented in its own exceptional case composed of 50 different parts, with Louis Moinet’s patent pending crown guard. Each watch also depicts a hand engraving on the dial depicting the meteorite’s trajectory towards the earth, represented by a pietersite gemstone placed beneath the hands.